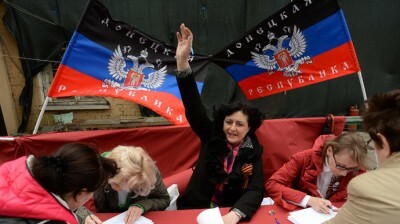 The Strange Logic of the US, EU: East Ukraine’s Referendums Aren’t Democratic But the Coup-Imposed Kiev Regime Is? Fraud. Farce. Fake. Undemocratic. No legality. Alternate realities. Zero credibility. Absurd. These are just some of the words used to describe the May 11, 2014 referendums in Eastern Ukraine by the US government and the member states of the European Union. The Russian Federation is being blamed for orchestrating the voting in Eastern Ukraine by the US, European Union, and North Atlantic Treaty Organization in alarmist and Russophobic language too. The incompetent US Department of State spokeswoman Jennifer Psaki, who was hired because of her history as a Democratic Party campaigner and not because of any understanding of international relations or foreign affairs, described the referenda in the easternmost oblasts of Donetsk and Luhansk (Lugansk) as a replay of Russia’s “Crimea playbook.” She was using the same talking points as her boss, US Secretary of State John Kerry. British Foreign Secretary William Hague declared that the votes carried no weight, had zero credibility, and did not “meet any standards.” He announced that voting in Eastern Ukraine “did not “meet any standard, not a single standard of objectivity, transparency, fairness or being properly conducted as a public referendum or election.” He added that the organizers were phonies pretending to meet the unspecified and “vague” standards that he was talking about. It is because of this very knack for hollow rhetoric that Secretary Hague has earned the nickname “William Vague.” His vague definitions were deliberately made, so as to discredit the democratic process in Eastern Ukraine. Dividing the world into the “civilized” and “uncivilized” before the referendums, John Kerry vowed that no “civilized” nations would recognize the results of the voting in Eastern Ukraine. In ethnocentric terms that displayed the desperation of Washington, what the top US diplomat pretentiously meant was that the US and its allies represented “civilization” and that any country that did not follow the lead of Washington was outside of the boundaries of those boundaries and, therefore, “uncivilized.” The “uncivilized” countries he was talking about are Russia and its allies and partners, such as Armenia, Belarus, Venezuela, Cuba, Bolivia, Tajikistan, and Iran. 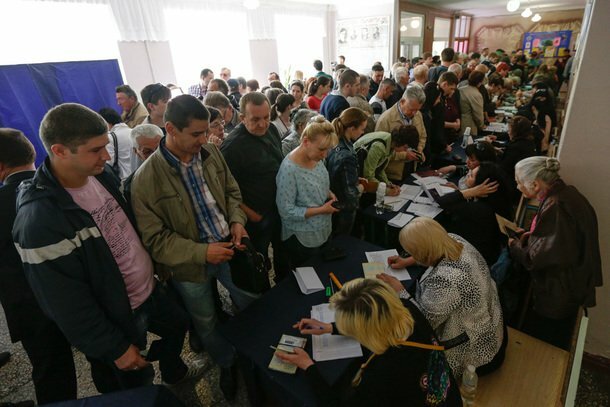 Regardless of what one thinks about the legitimacy of the referendums in Eastern Ukraine, they were popularly supported and had high participation. 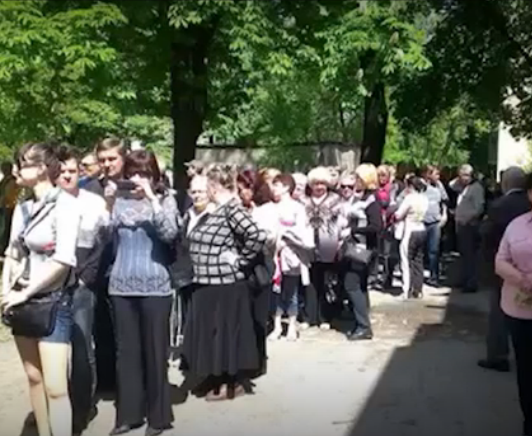 Despite, the fact that the regime in Kiev tried to use fear tactics against them, Eastern Ukrainians gathered in droves and waited in long lines to vote. 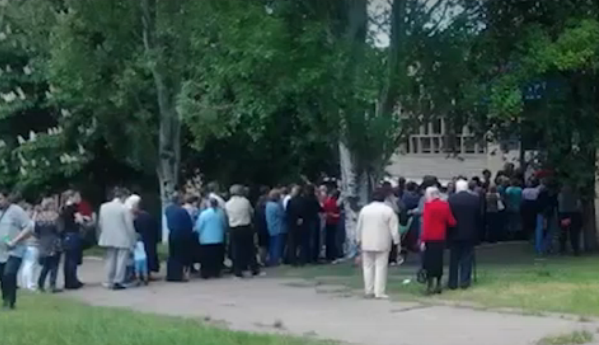 Large crowds gathered to vote even though the unelected US-supported Yatsenyuk regime, which incorporated the ultra-nationalist gunmen that executed the February 2014 coup into the ranks and files of the Ukrainian military and security apparatus under official capacities, sent its armed militias into their cities to disrupt the voting. In the process of trying to prevent the voting from taking place under the pretext of anti-terrorism operations the US-backed regime even wounded and killed several unarmed civilians. They say a picture is worth more than a thousand words. 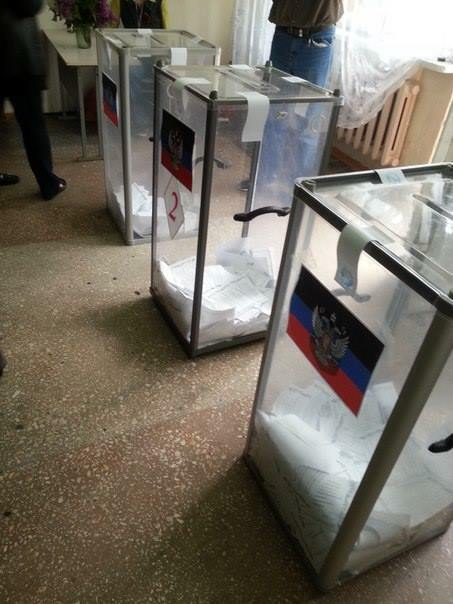 Then the photographs and videos from the voting in Eastern Ukraine should be able to drown out all the noise from the spin doctors occupying Kiev and their masters in Washington and the European Union. Not only does the Yatsenyuk regime have the gall to question. the legitimacy of the local authorities in Eastern Ukraine, it has also tried establish some type of martial law in Eastern Ukraine. If Euro-Maidan was about democracy and choosing popular leaders, then why are Eastern Ukrainians not allowed to pick their own popular leaders? Why has the Yatsenyuk regime tried to force its own officials on them? Is this democratic and compatible to the words coming out of the mouths of Yatsenyuk, Tymoshenko, and their cohort? 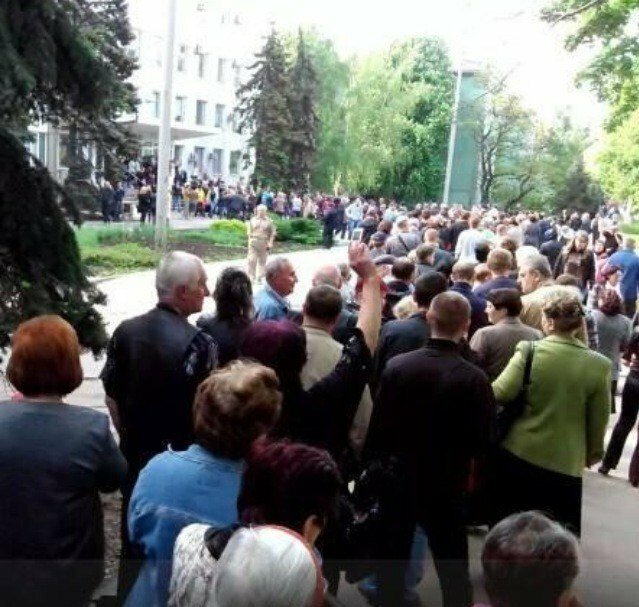 Regardless of questions of legality, the point should not be lost that when authentic “people power” is at play in places like Eastern Ukraine or Bahrain, where ordinary people are struggling for their rights,the US government and the European Union always oppose them and come out in support of the tyrants oppressing them. Not only have the predominantly peaceful and unarmed citizens of Eastern Ukraine been called terrorists by the Yatsenyuk regime and its supporters, but they are now being referred to as “insurgents” by the foreign governments and media networks that support the coup-installed regime in Kiev. There is a deliberate perversion of the term that is trying to equate Eastern Ukraine’s population with mutineers just for standing up for their rights.Moreover, the use of the term exposes the political position and underlying opinions of its users. Mutineers are those that mutiny against a legitimate authority; there is no legitimate authority in Ukraine. The Yatsenyuk junta and its foreign backers are the blatant transgressors. This puppet regime, which illegally occupies the offices of government, and its handlers in Washington and the European Union have no moral or legal authority to lecture about referenda or democracy after ravaging Ukraine and crippling democracy. Nor do the news reports from much of the mainstream media in North America and the European Union that have been trying to undermine Eastern Ukraine represent the events on the ground in either their or the western half of Ukraine. These actors are all distorting the facts about the referendums that took place in Eastern Ukraine. Moreover, they are trying to blame Russia for the fire that they have started in Ukraine and using the events there as a pretext to justify their long-term intentions to cripple Russia and its allies, which are now surfacing. 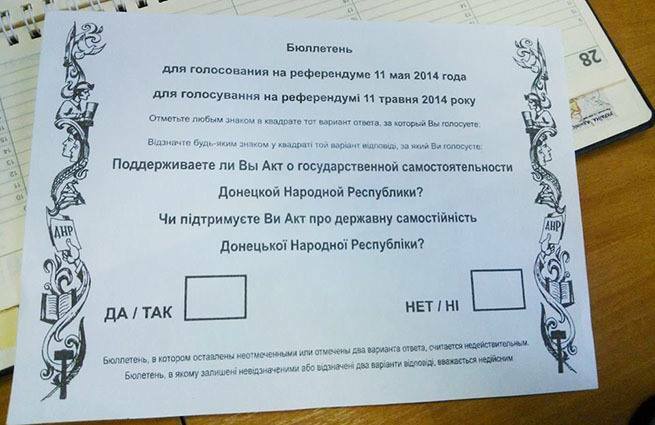 There are blatantly lies being fabricated about the voting in Eastern Ukraine in an attempt to discredit it. 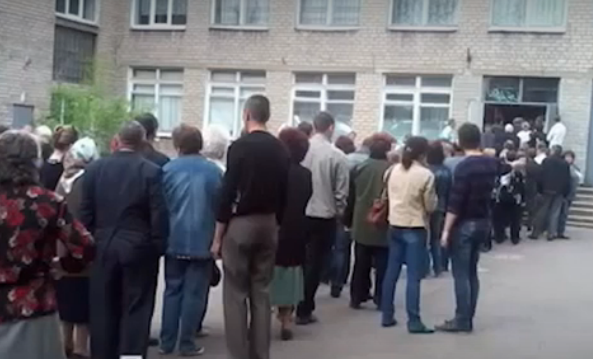 Despite its shortcomings and lack of uniformity, which are all visible when observing the different footage of the voting process, it is remarkable that the local communities in Eastern Ukraine organized the referendums, especially after the illegal government in Kiev tried to obstruct the voting. Volunteers manned schools and public buildings for the voting process. 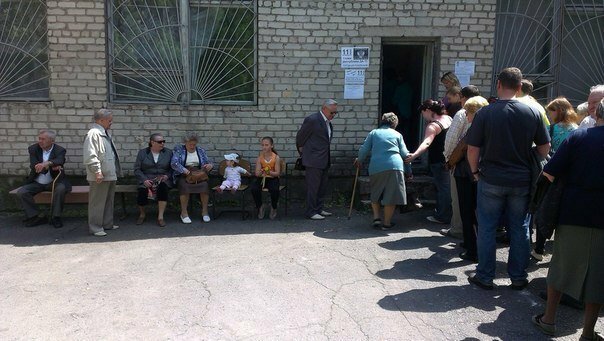 One of the dirty tricks that the Yatsenyuk regime in Kiev played was to block the local authorities in Eastern Ukraine from having access to an updated census and electoral list. Because of this, the local authorities had to build on older electoral records. 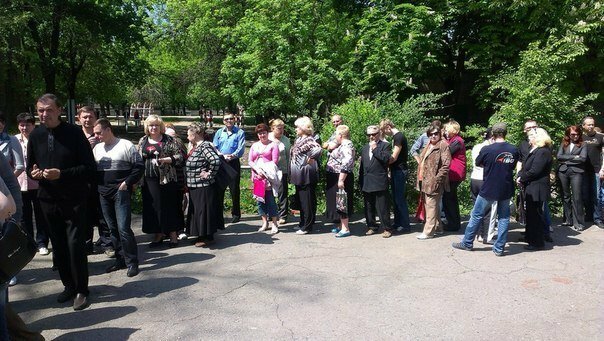 The local authorities are not the ones that should be faulted for this, but the coup-imposed regime in Kiev. 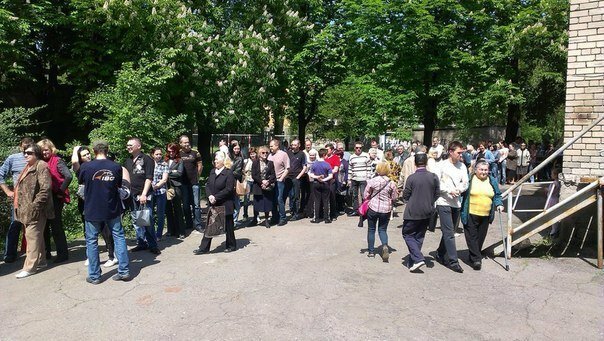 It is the Yatsenyuk regime that has prevented the local authorities from making the local voting as fair as possible. 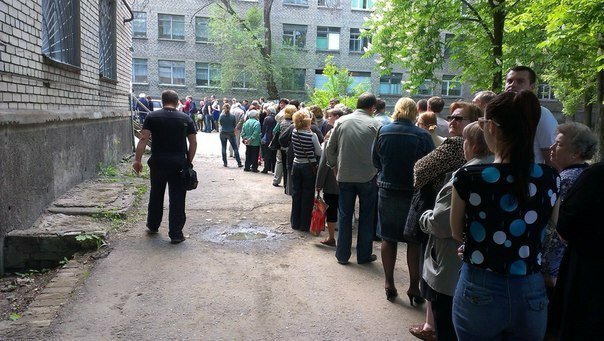 Despite the junta in Kiev’s attempts to obstruct the election, the local authorities still did the best job possible in preparing the referendum polls. The comments that the Kremlin is responsible for mobilizing millions of Eastern Ukrainians is demeaning to the Ukrainians that oppose the coup-installed regime in Kiev and an insult to them as independent actors. 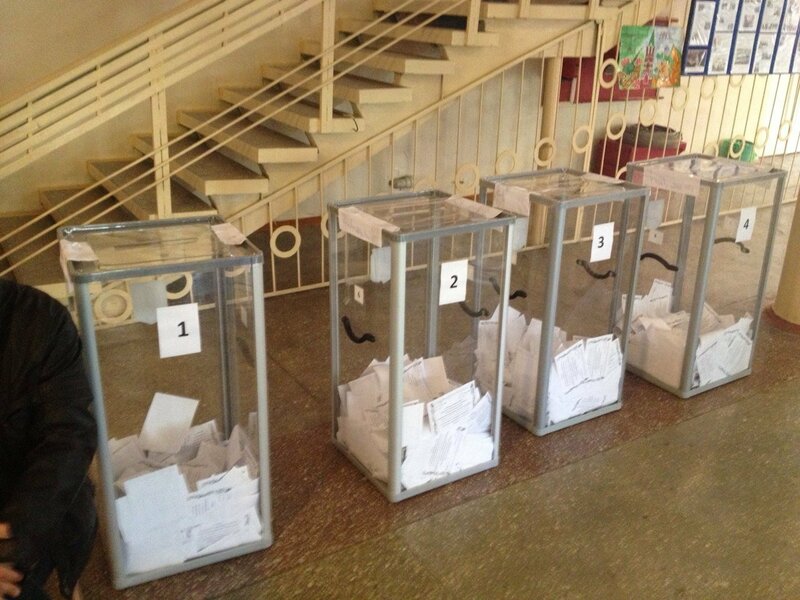 The demeaning positions taken by the US and the European Union about the voting in Eastern Ukraine is self-serving. In Serbia’s predominately-Albanian province of Kosovo, where there was no popular voting by the inhabitants, the positions of the US and the European Union were totally different and they recognized its independence without any referendum or popular vote. Eastern Ukrainians are making their own decisions, wishing to dissociate themselves from the coup-imposed regime in Kiev. Western Ukrainians should not be forgotten too. Many Ukrainians in the western half of the country are hostages to the militias and forces that have hijacked their republic.